in the Columbia River Basin. It does not consider breaching Snake River dams. PORTLAND -- The federal government's management plan for protecting salmon and steelhead populations imperiled by federal dams in the Columbia River Basin differs little from its earlier version and continues to rely heavily on habitat improvement. The court-ordered plan, known as a biological opinion, was released by the National Oceanic and Atmospheric Administration (NOAA) fisheries service on Friday. Its various iterations have been litigated in court for more than two decades. The most recent plan was issued in 2008 to cover a 10-year period through 2018, and a supplemental biological opinion was added in 2010. The plan was struck down in court in 2011 for a third time -- for depending too much on habitat improvements whose benefits are unknown. Conservation and fishing groups, Oregon and the Nez Perce Tribe, which have challenged the previous plans in court, say the new version preserves the status quo and does little to help the fish. Thirteen species of salmon and steelhead are listed as endangered or threatened under the Endangered Species Act in the Columbia Basin, and some have been listed for more than 20 years. Even as officials have spent millions on habitat restoration and are touting its benefits in this latest plan, they acknowledge that fish populations are barely hanging on and nowhere close to being recovered. "The actions are designed to move us in a direction toward recovery and avoid jeopardy. The plan is not designed to achieve recovery," said Barry Thom, deputy regional administrator of NOAA Fisheries West Coast Region. 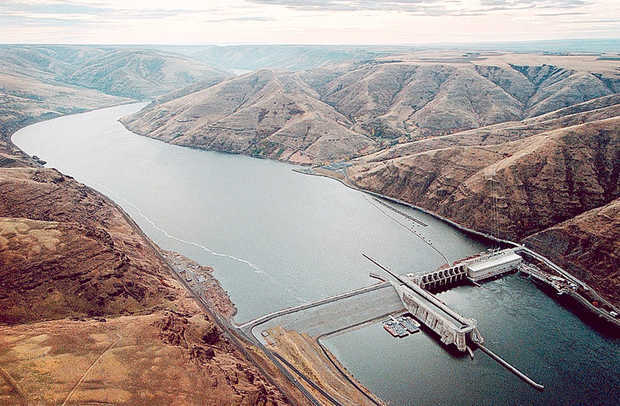 Critics have long called for the government to examine the possibility of breaching four Snake River dams, increasing the water spilled over dams to allow more fish to escape a trip through turbines, and increasing river flows. Ten years ago, after rejecting an earlier management plan, U.S. District Judge James Redden ordered the government to allow water to pass over the dams when juvenile salmon are migrating to the ocean. By spilling water over the dams to help fish, authorities are giving up millions of dollars in revenue from electricity generated by turbines. In 2011, Redden, who announced his retirement last year and stepped off the case, asked NOAA to consider whether more aggressive actions such as dam removal are necessary. But the new plan does not consider the possibility of breaching dams or increasing spill because officials say such actions aren't needed. The government says habitat projects are starting to work, with more of fish returning to spawn, and the plan will continue to protect the fish into the future. Yet officials acknowledge that productivity -- the number of the next generation of adults produced by fish returning and spawning -- has been lower. With the spawning population higher, not enough habitat is available in tributaries and juvenile survival has declined, officials said. Hence a need to restore more habitat. Proponents of the plan praised the government's habitat projects and pointed to last year's large fall chinook returns as evidence of improvement. "More than 1 million fall chinook salmon returned to spawn last year, the highest numbers since Bonneville Dam opened in 1938," said Terry Flores, executive director of Northwest RiverPartners, which represents electric utility, agriculture, ports and other businesses. But critics say that while restoring habitat could benefit fish, habitat by itself won't cause salmon and steelhead to return. They say main-stem passage is the survival bottleneck for the species, not a crowded habitat. And while they agree some fish stocks are showing modest improvement, they are nowhere near recovery, said Todd True, an attorney with Earthjustice who represents environmental groups in the court case. Only a tiny percent of adult fish are returning to the rivers, True said, and a large percentage of those are hatchery fish. On some runs, he said, up to 80 percent of returnees are hatchery fish. "That doesn't sound to me like habitat is beginning to work," he said. Critics also decried the plan for reducing spill on several dams and for not including separate measures to address the effects of climate change. Officials said habitat projects already "help us buffer against future climate change impacts." Whether or not the plan is again challenged in court, it will be in place just for another four years. In short order, the government says it will need to start discussing another biological opinion that would be put in place in 2018.